If you have a family at home, a two-door sports car simply will not cut it. That’s why Porsche makes the Panamera. It’s a four-door luxury sedan that delivers plenty of excitement. Outstanding comfort also gives you a reason to take this car on a weekend road trip. Porsche’s traditional styling makes the Panamera even more appetizing. While the 2019 Porsche Panamera is a cool ride, a steep sticker price makes it an expensive purchase for the average car buyer. Should you head out to the dealership to test drive a new Panamera? This year, Porsche has unveiled a new GTS model. It’s designed to deliver an enhanced degree of performance. A new color heads-up display has also been added to the Panamera’s list of available features. The base 2019 Porsche Panamera does not shortchange you in the performance department. It’s put into motion by a turbocharged V6 engine, which pours out a solid 330 horsepower. Like all variants of the Panamera, this entry-level trim is paired to an eight-speed automatic gearbox. Although some drivers will ultimately desire more power, most people will find the base Panamera’s kick to be strong enough. If you care about conserving fuel, check out the 2019 Porsche Panamera E-Hybrid. It’s motivated by the combination of a small electric motor and a twin-turbo V6 engine. With 462 horsepower on tap, the Panamera E-Hybrid definitely feels exciting. You’ll be able to easily keep pace with the typical muscle car. A combined fuel economy rating of 27 mpg gives drivers another reason to smile. By activating the hybrid’s all-electric mode, folks can travel up to 30 miles without burning any gasoline. While all versions of the 2019 Porsche Panamera have the ability to captivate drivers, the high-performance GTS model is in a different league. It could be the most exciting Panamera model to ever be released. The fun starts with a boosted V8 engine, which unleashes a thrilling 460 horsepower. Driving enthusiasts will love the GTS model’s racy exhaust note. A re-calibrated air suspension and lowered ride height promotes crisper handling. This is definitely the best model for the track. Although the 2019 Porsche Panamera is a family-sized sedan, it still hugs the road like a classic Porsche sports car. As soon as you take the Panamera on the road, you’ll quickly realize that it’s not your typical luxury cruiser. Test drivers rave about how well the Panamera behaves around curves. There’s very little body roll to speak of. Accurate steering enables drivers to relax on the open highway. There’s no overlooking the fact that the four-door Panamera is larger than a typical Porsche sports car. Nevertheless, it has the same curvaceous body lines. Everyone on the road will notice its distinctive headlights and signature roof. It also sits low to the ground like a traditional Porsche coupe. A nice set of 19-inch alloy wheels come standard. Exotic paint colors, such as Mamba Green Metallic and Sapphire Blue Metallic, make the Panamera look even more exclusive. No longer do Porsche fans have to give up any practicality. While the new 2019 Porsche Panamera is fun for drivers, it’s also an impressive family car. Seat comfort is among the segment’s elite. Because the front seats are so accommodating, all-day road trips won’t cause stiffness. Furthermore, drivers of all sizes can fit behind the wheel. Most importantly, there’s enough legroom in the back to satisfy tall folks. Stamped with an MRSP of more than $86,000, the 2019 Porsche Panamera is definitely not a cheap thrill. Nevertheless, it does give buyers a lot of luxury for their hard-earned cash. Even the base Panamera feels remarkably lavish on the inside. A sturdy interior construction also helps make the new Panamera worth its high price. Although upgraded upholstery is available, even the standard partial-leather upholstery will catch your eye. Most of the Panamera’s optional equipment is quite costly. Luckily, a good amount of equipment now comes standard. A lot of drivers will enjoy the wide-view navigation screen, which helps when traveling out of town. Meanwhile, the Wi-Fi hot spot will enable you and your passengers to remain linked to the internet. Some of the other standard items include a panoramic sunroof, keyless ignition, and Apple CarPlay. 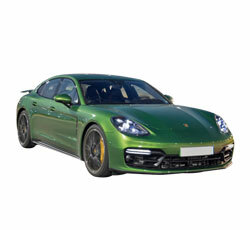 Porsche now offers the Panamera with a new color head-up display. It’s a valuable feature that helps keep your eyes positioned on the road ahead. When you’re enjoying the sedan’s performance capabilities, you won’t have to glimpse down at the speedometer. If you are not content with the Panamera’s standard safety equipment, you have access to some cutting-edge driving aids. By keeping you a safe distance away from the next vehicle ahead, Traffic Jam Assist helps prevent collisions on congested roadways. Meanwhile, night vision makes driving on dark country roads a bit safer. Some of the other available safety technologies include blind-spot detection, lane departure mitigation, and forward collision alert. The number one thing that turns people away from the Panamera is its steep asking price. While prices start a more than $86,000, adding options such as the Bose sound system and adaptive headlights will force you to spend more cash. If you have your heart set on the high-performance GTS model, prepare to shell out at least $128,000 before adding any upgrades. Although the 2019 Porsche Panamera is generally considered to be a stunning car, not everyone will like its unique design. This is especially true for some die-hard sports car fans. It certainly looks different from a traditional Porsche coupe. Before you buy a new Panamera, be sure you admire its styling. Some people will have trouble using the Panamera’s infotainment system. Although its wide-view screen is great, it’s a bit difficult to use at first. Adjusting the interface to your likely will require several steps. BMW’s iDrive interface is a better overall system. The 2019 Porsche Panamera is a world-class luxury car. It’s not a good choice for the drivers who enjoy tinkering under the hood. A lot of high-tech engineering is found on the new Panamera. Not all of the sedan’s interior controls are easy to use. The touch-responsive climate control system can be distracting. Some drivers will also not like the Panamera’s non-traditional gear shifter. The 2019 Audi A7 is a less expensive alternative to the 2019 Porsche Panamera. Like the Panamera, it has a hatchback body style. Although the A7 may not have the prestige of the Panamera, you stand to save a bundle of cash. If you are in the market for a high-dollar luxury sedan, you should also sample the 2019 Mercedes-Benz S-Class. The S-Class has an extravagant interior and can match the Panamera’s performance capabilities. However, some road trippers may be lured by the Panamera’s extra cargo space. If the Porsche Panamera is too expensive for your wallet, take a look at the budget-friendly Kia Stinger. Although the Stinger does feel nearly as luxurious as the Panamera, don’t overlook this car’s fun factor. This underrated sports sedan has the ability to rip a 0-60 time of 4.5 seconds. Prices for the high-output Stinger GT1 start at less than $50,000. Porsche has successfully created a four-dour sports cars in the new Panamera. Although the Panamera may be a great driver’s car, it also ranks high as a family vehicle. The race-bred GTS model should get the attention of folks seeking even more driving excitement. Despite its many perks, this four-door Porsche is expensive. Some drivers will ultimately be forced to search for a more budget-friendly alternative.